Although Salzburg felt more inherently “Austrian” to me, there’s no denying that Vienna is a world-class capital that solidly represents its country. Famed for its waltz, legendary music, Lipizzaner stallions, UNESCO World Heritage Site city center, final bastion of Christianity against the surging Ottoman Empire, and coffee houses and pastries, the Austrian capital’s cultural and historical richness is as deep and sweet as its sachertortes. 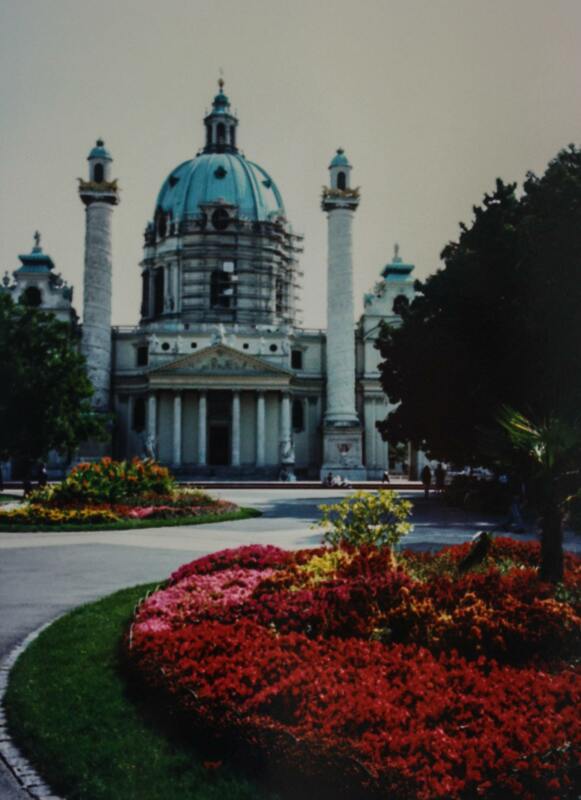 Throughout the city, and particularly along the Ringstraße, or the Ring Road (which was constructed to replace the restrictive city walls as decreed by Emperor Franz Joseph I, who took a very hands-on approach to the project by outlining the size of the road as well as the location and function of new edifices), gorgeous architecture abounds, a collection of highly detailed, royal, truly memorable buildings. These are my favorites. Dedicated to the first Christian martyr, St. Stephen’s Cathedral owes its existence today to a Nazi. Captain Gerhard Klinkicht disobeyed the orders of his superior officer to “leave it in debris and ashes” as the Germans retreated toward the end of World War II. Most likely, he was awed by the cathedral and couldn’t bear to destroy something so beautiful that had been around for hundreds of years. This iconic building has more than a handful of highlights to explore in between the nearly two dozen services it holds every week. The massive tower with the soaring spire punctures the sky at 446 feet tall — not too shabby for a structure that took 65 years to build and was completed in 1433. Even older are the twin Roman Towers, which derived their name from the rubble of ancient Roman structures that stood here and were used in their construction. Inside, the tremendous interior features a gorgeous pulpit — a Gothic masterpiece with highly detailed relief portraits of St. Ambrose, St. Augustine of Hippo, St. Gregory the Great, and St. Jerome. There are multiple altars and chapels, tombs and crypts, and statues and architectural flourishes to discover, and once I had soaked in as many as possible, I climbed the 343 stairs in the south tower for a close-up view of the cathedral’s newest and perhaps most arresting feature — a steep 364-foot-long roof covered with 230,000 glazed tiles. 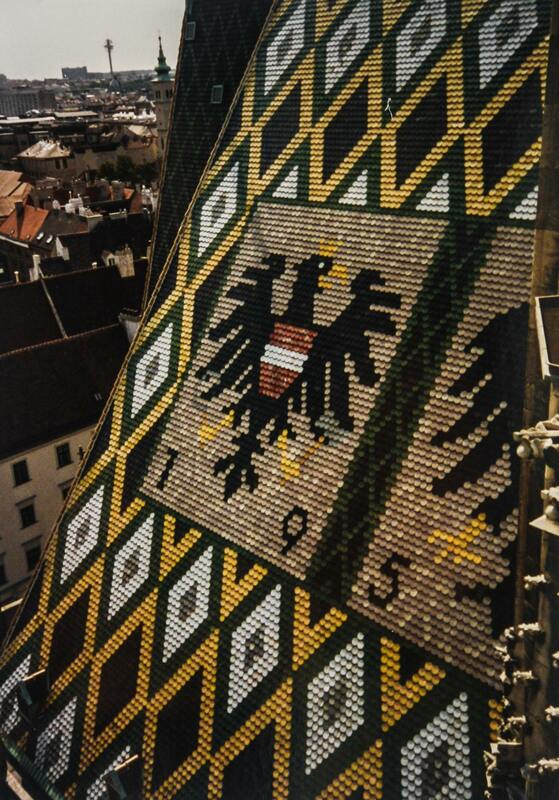 Part of the roof is a hypnotizing herringbone pattern in green, blue, yellow, and black tiles; another part utilizes the same colors in diamonds laid around two eagles, one with the coat of arms of the city of Vienna, the other with that of the Republic of Austria. The year 1950 underlines both eagles — the year in which this roof was completed following a major fire five years earlier. It’s hard to overstate the beauty of this cathedral, and I imagine that the three million people who visit it annually would be equally hard pressed to conjure up any adjective that does it justice. If I were one of the more than 2,000 people who work in the Vienna City Hall, the head office of the city’s municipal administration, I’d probably be pretty happy to go to work every day. 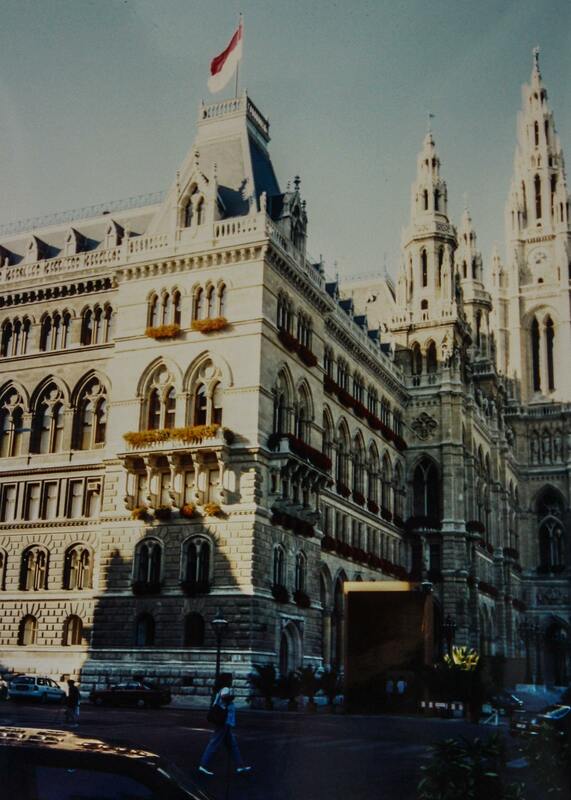 Completed in 1883, this neo-Gothic confection fronts the Rathauspark, from which I enjoyed unimpeded views of the fanciful façade. Above flowerboxes filled with red geraniums, an almost uninterrupted row of Gothic windows, each featuring a triangular arrangement of three quatrefoil windows in the top third, runs the entire width of the building. Above them, standing atop the balustrade, about 25 statues of Habsburg notables keep watch over the city. That leads up to the steep roof pierced by small triangular windows and the four steeples, two on each side of the main central tower, which, at just over 321 feet tall, would not seem at all inappropriate atop a Gothic cathedral, what with its four clock faces and wedding-cake frills. It’s all topped by the Rathausmann, an 11-foot-tall iron standard-bearer forged from melted-down Russian kopecks. When an assassination attempt on Austrian Emperor Franz Joseph failed in 1853, his brother, Archduke Ferdinand Maximilian, didn’t just say a prayer of thanks. He decided to build an entire church instead. 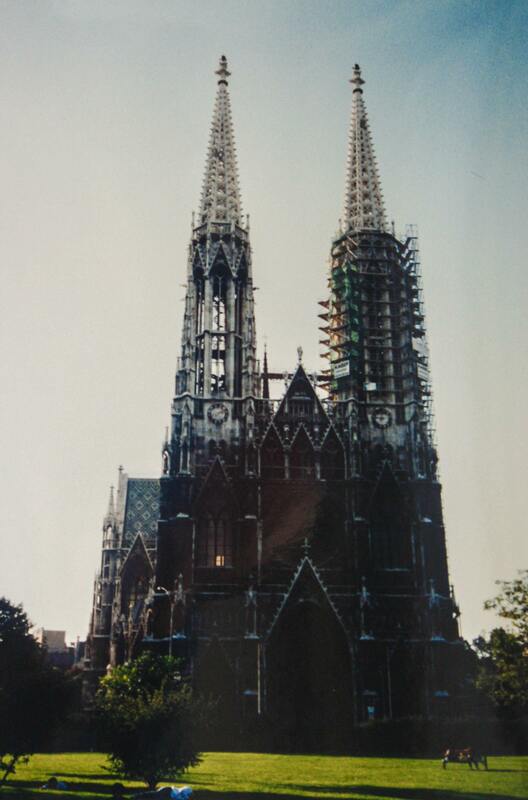 Twenty-three years of construction later, the Votive Church was consecrated in 1879. The church of white sandstone is a neo-Gothic beauty that, when I was there, was largely blackened by decades of pollution and acid rain. Nevertheless, the two partially cleaned, soaring towers, rose window, flying buttresses, and roof with a gray diamond pattern in mosaic captured my attention. Inside, the baldacchino on the main altar, with its gables and pinnacles, looks like a smaller version of the church itself. Given the relatively short span of time from groundbreaking to consecration, the entire building maintains an unmistakable uniformity of style, from the columns to the arches to the finer details. And when you learn that it was designed by architect Heinrich von Ferstel when he was only 26 years old, it instantly becomes even more impressive. Under the hexagonal pulpit, you’ll find a sculpture of the man himself, forever at home in his brilliant accomplishment. 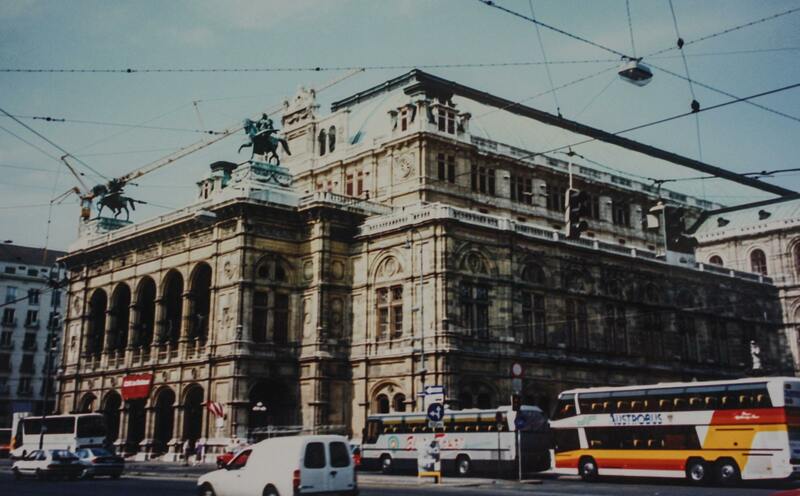 The Vienna State Opera House was the first major building and one of the grandest to be completed on the Vienna Ringstraße, in 1869. Heavily damaged during a bombing in World War II, resulting in the total destruction of the auditorium and stage, as well as props for 120 operas and 150,000 costumes, the opera house was rebuilt to the original design, a wise decision for which I was grateful as I admired this neo-Renaissance structure. It appears largest when you view it from the rear, where the stage wings extend out from the center, but it’s the front that’s the real treat. The double loggia of squat round arches on the street level are topped by taller, more decorative ones on the second level, in between which stand statues representing comedy, drama, heroism, imagination, and love — all the components of a solid opera. On the roof, two winged horses, ridden by allegorical representations of harmony and poetry, seem poised to fly off the building. Initially criticized for creating an opera house that was shorter and not as spectacular as another building across the street, the architect committed suicide in despair, and his partner died of tuberculosis just over two months later. That alone, it seems, would make a fitting opera to be performed in this tremendous building. St. Charles’ Church is widely considered the most important Baroque religious building in Vienna; indeed, this house of worship, completed in 1737, is truly a standout. The water feature it fronts provides a calming approach to the entrance, styled like a Greek temple portico and flanked by two angels. The central feature is the unmistakable arrangement of a gold cross atop a gold ball, atop a hexagonal lantern, atop a copper-green dome with two levels of windows, atop a high drum, rising almost 230 feet. The same copper-green color at the top of the two tower pavilions provides a wonderful contrast to the bright white of the building. As if all that visual appeal weren’t enough to impress me, I was completely won over by the church’s most unusual feature: two bas-relief columns, at about 108 feet tall, that depict scenes from the life of St. Charles Borromeo in bands that spiral around the columns all the way to the top. The Italian cardinal was revered as a healer for those who suffered from the plague, and it is he for whom Charles VI, Holy Roman Emperor, dedicated this church, one year after the last great plague epidemic in the region. We only spent one day in Vienna and I’m surprised at how many of these buildings we actually saw. Did not know that tourism was such a large part of the country’s gross income. You can see why, though! Truly beautiful. Glad you got to see so much in such a short time.